With millions of regular users on Facebook, Twitter, and other platforms businesses are often excited to get involved,even if it isn’t in their best interest.Discover why so many business need social media and are happy to jump on the bandwagon, before we discuss whether or not yours should. Most people are going to tell you everyone should be active in social media, but I think that has more to do with the excitement behind social media and what it CAN do for business, not exactly what it will do for yours. At Social Media Fuze, we do not recommend every business be active on social media. There are many factors that should be considered before deciding to be active. Follow these steps to help you decide what and where you should place your social media focus. Step 1: Who Is Your Target Customer? What are they getting on social media for? Do you have a lot of active social media customers already? Where are your customers active? These questions are important because if you don’t have favorable circumstances for success with social media your company could spend thousands of dollars advertising, growing a following, driving traffic to your profiles, or holding contests for nothing.A part of your plan should focus on being active where your customers are already active. Step 2: Does Social Make Sense for Your Products or Services? Is your brand big enough that you are expected to be on social media? Do you get a lot of web traffic, product name searches, traffic from search engines? Do you have authority, knowledge, trust, any kind of following? If you have a large brand, the public just expects you to be active in social media. There is no reason not to be, just for PR purposes, you just need to make it interesting to your followers. It is a perfect opportunity to communicate with your customers. If you do not have a large brand, but you do have a growing email list of thousands of prospects or customers, you know your industry well, and you can spend time providing answers, and knowledge to visitors, you have good reasons to look forward to a favorable campaign. If you do not have any kind of presence, any leads, followers, etc, social media is a great place to launch, but you need to have a clear plan, and you need to understand the time, and or money investment that is necessary to make this work. Step 3: Is It Right For Your Business? Can you afford to get started? Do you know it can take months to see a return? Do the circumstances favor your success with using social media? How do your competitors do with social marketing? 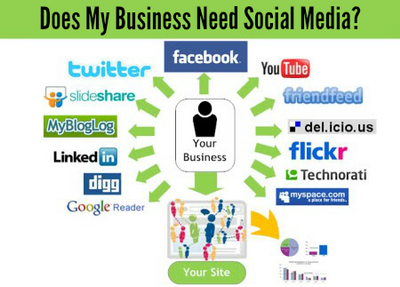 As previously discussed, to make social media for your business work you will need a plan. Part of the plan will be covering the time it takes to build your following, see how they respond to content, set up monitoring campaigns, and reputation management. The question is, can you afford it, or do you need something more concrete? Why do you want to go with social media? Have you researched how well competitors are doing with it? Once you’ve gone through all of this, you can make an educated guess about whether it is a wise decision to pursue social media marketing. Even if you don’t want to provide regular updates, it may be important for your business to keep a pulse on what users are saying for PR purposes. You can also set up campaigns to target potential prospects looking for someone with your products and services. When these words are mentioned, the reputation manager will look With positive comments, it will just be noted for future discussion, A reputation manager will be trained to look for signs of problems, This type of management can save a company thousands to millions. With monitoring campaigns you can put your ear up to the conversation Tools for monitoring campaigns usually allow you to choose You can target conversations within 50 miles of your business. Monitoring campaigns can be country wise if you have a website You can check in on them several times a day, and reach out. The cost of social media management, consulting, and strategy will depend on who is doing the work, their level of expertise, what services they are rendering, and how successful you can expect your results to be. Now that you have a better idea of whether or not Social media is a good idea for your business, it’s important to understand the costs. So many businesses are strapped for cash these days due to fewer loans, the vast number of one person businesses, and large bills. Even if social media for business sounds like a good option, it may not be, financially. Before we discuss learning how to do it, or getting coaching, let’s talk about the price of hiring someone to do it for you. How much does it cost to hire someone? An intern still has a lot to learn is most cases, and practices based They have used social media to connect with friends and family but they haven’t used social media for business before. Your business will be their experiment, one of their first steps into professional social media, and it’s a gamble that could go either way. Sure, they could get great results, but in general practice makes perfect, and they are largely just starting to practice. That said interns do need a shot, and work out well, if you have a social media expert you are willing to have them work with, an expert already proficient in the field. For brevity’s sake, you can probably assume the cheap $10 per hour social media person will need training, has very little professional experience with social media, and while they are excited to have such an “easy” job, they probably do not understand much about the marketing aspects behind social media. A lot of companies like to hire someone like a social media consultant to have in-office, and the benefits are there. You can easily make sure they are working, you are getting your money’s worth, you can share ideas with them easily, and you have more perceived control over your accounts. Your accounts will get more personal attention. You will probably have to provide additional training to keep them up to date on industry changes, developments, and tools. The biggest limitation here is that you do not have a whole team of social media experts working on your strategy, implementation, reporting, and tracking results. The nice thing about hiring a company who specializes in social media for business, is they work on this topic all day, everyday. They are on top of new developments, new ideas, and they have their hands deep in the results, knowing exactly what does and does not work. Firms are also less expensive than hiring a full time, or even a part time employee. They require less involvement from yourself (who is already busy running a business) and they have processes and results that give proven results you can immediately benefit from. I started off this section to discuss price, but I first wanted to cover everything that is necessary to make a social media campaign successful. Now that that has been covered, let’s really discuss the price. For a group or firm to handle your social media campaigns on a monthly basis you are looking at $500-$3,000 a month based on the results you want. Set up- While you might already have accounts, they will need to be updated for best practices. For example: On Twitter you want a background and professional profile pic. You want a bio that describes your business and encourages people to follow you. The bio should also have keywords and hash tags that are researched for best results. You will pay a setup fee that will cover setting up social media accounts for the first time, or making changes to those that already exist. Usually you can expect to pay $100-$500 per platform, though this is sometimes part of a bundled price for services. A firm, employee, or contractor is going to cost more based on the complication of the social media activities they are hired to do. Get familiar with some of these activities to understand what you are paying for. 1. Analysis of existing accounts and processes- do you already have accounts, where do you have them, how often do you post to them, what apps do you use? 2.Optimization of current accounts- initiate best practices for posting, profiles, images, linking, hash tags, mentions, pins, video posting, and tagging. 3.Set your goals- Why do you want to be active in social media? Prioritize the goals you have for social media, and compare them with your overall business model. Incorporate social media where appropriate, and coordinate. 4.Content calendar & strategy- Plan out what to post, when to post it, and an overall strategy to reach your goals. 5.Tracking & Setup-What programs will you use to track results? What tools and applications will you use to automate where you can, and to respond to your visitors as quickly as possible? How much can you afford to spend, and how much will you spend? 6.Implement- Put your plan into action. Take all of the plans you have made and start following your plan to reach your goals. 7. Monitor- Keep track of certain keywords, hash tags and platforms for conversations that pertain to your business. 8. Stay Educated- Continually read up on best industry practices, books by experts, blogs and courses to stay updated on changes, strategies, and others’ results. 9. Analyze and Respond- Every 2 weeks and then monthly begin looking at your tracking and results to see what is working, what has changed, and what needs to be changed. Chances are things will change with platform changes, in accordance to your business goals and tasks, etc. 10. Promotions- Occasionally you will want to run a promotion to increase followers, give away a prize, or advertise about a sale, yearly event, etc. These should be planned out, to get the best results. Being active in social doesn’t mean you should be present on every social media platform.Based on previous chapters, follow these guidelines to choose the best platforms for your business. The biggest indication of whether or not you should be active on social media is: whether or not your customers and competitors are. Facebook- A platform for everyone, consider this as one of the first places to be active, if everything else lines up from previous chapters.Look for a facebook expert next. Twitter- First check to see if your community is active, past this, look for related keywords and hashtags for a good indication. Youtube- Video is absolutely huge, if you have any tutorials/reviews/physical products/screen shares you can share, this is the place to be. Pinterest- Do you have images to share? Pictures of products? This is a great place for ecommerce. LinkedIn- Particularly important if you are B2B or you are looking for a job. Google + – Very active for engineers, and other highly social groups, check for large groups of your target market. Social media comes from the idea of making it easy for people to connect. Being active in social media, means building relationships with your followers, and making meaningful connections that will benefit your business. Another component of social media is building relationships with followers. People use social platforms to connect with friends and family, and research has found they also like to connect with businesses. Many businesses are still attempting to understand the importance of relationship building and its involvement in successful social media marketing. If you feel that social media is a good venture for your business, here is what you should know about how social media and relationships go hand in hand. Because people want to connect, when they like a company, they may like or follow them on social media, this is an effort on their behalf to learn more about your business, get special offers, and build a relationship with someone in the business. Every account is handled by a person,he can be a social media expert, and people seek to connect to the person handling your account. As that person connects with more people, seeks to help them and answer their comments, and provides them with value, the person on the other end likes the brand more, talks about them in social media, and becomes a brand-influencer. A brand-influencer is someone that influences others in regards to your brand. This is free positive advertising and while it isn’t measurable by most means, it is something every company hopes for: people who love their products so much, they can’t help but get more customers for the company. Whole post has been written about building relationships with followers, but I will do my best to give you ideas on how to build your own relationships. To begin with, you want to connect with people whenever possible. Give them every opportunity to connect with you. Share some personal details, preferences, etc. Once you’ve considered all of the questions in this guide you should be able to make an educated guess about whether social media is a good investment for your company. We’ve often had people wonder what kind of investment to start with to test the waters, what platforms to start with, or our professional opinion about when it is best to get started. We are always available to help you with these questions, go to the link on the next page, to get help with any questions you have based on this guide, or otherwise. We are happy to help. Feel free to visit us on any of social networks. We would love it, if you would tell your friends about us on Facebook or Twitter if you enjoyed this guide. © 2015, Social Media Expert. All rights reserved. I thought this was a great article. So many social media articles push readers/business owners into a corner on why they need it, instead of considering some of the important factors you mentioned (Age, what platforms your target customers are on). HubShout has an awesome infographic with social media stats that may interest your readers and back up your excellent statements.